McAngus Goudelock & Courie, a regional insurance defense firm, announced that attorney Leslie Simpson has been recognized as a “Phenom” by the Columbia Regional Business Report at the inaugural “Icons & Phenoms” event on Thurs., April 11. Along with 23 other business professionals, Simpson was recognized for her influence on the community and being an up-and-coming go-getter who is changing the landscape of the Midlands. “We are extremely proud of Leslie and all she does to impact both the legal community and the greater Midlands area,” said Jay Courie, managing member of MGC. Simpson’s practice focuses on workers’ compensation defense in the firm’s Columbia office. Prior to joining MGC, she served as a staff attorney for the South Carolina Senate Judiciary Committee, concentrating on workers’ compensation, the children’s code and domestic relations. Simpson received a Juris Doctor from the University of South Carolina School of Law and a Bachelor of Science degree from Claflin University. 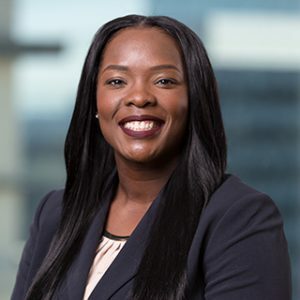 She is a member of the South Carolina Women Lawyers Association, South Carolina Black Lawyers Association, Richland County Bar Assocation and South Carolina Bar Association’s Young Lawyers Division, where she serves on the Color of Justice Committee, Diversity Committee and Community Law Week Committee. Simpson serves as the cheerleading coach at Claflin University and is also involved in Delta Sigma Theta Sorority, Inc.
McAngus Goudelock and Courie is a metrics-driven law firm built specifically to meet the needs of insurance companies and their customers. From 15 regional offices, we serve clients across the Southeast. For more information, please visit www.mgclaw.com.